The American submarine campaign in the Pacific during World War II was a major contributor to the ultimate defeat of Japan. During the war, American submarines comprised less than two percent of the U.S. Navy, but sank almost 60 percent of the Japanese merchant marine and more than 30 percent of Japan's navy, including eight aircraft carriers. 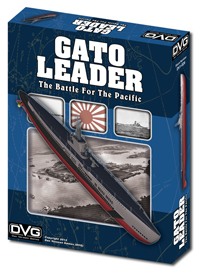 Gato Leader moves the Leader series to Pacific waters, letting players lead a group of American submarines against the Empire of Japan. The core system of the game is built on U-Boat Leader and will be familiar to players of other Leader games, allowing them to get into the game quickly. A major portion of the game is determining where to send your submarines. Do you send your boats to the distant, better-defended, merchant-rich Japanese Home Waters, or do you hit the convoys supplying the far-flung Japanese bases? You can spend Special Operations Points to upgrade your submarines, concentrate intelligence resources, and send your submarines on special missions, such as mine-laying and hunting the Imperial Japanese Navy. When a patrolling submarine encounters an enemy force the action then shifts to the tactical display where the submarine tries to close with and attack merchants while avoiding the escorting warships. When an attack starts you will have an idea of the number and general type of ships in the group, but you have to close with the ships to identify the ships and decide which ones are worth firing torpedoes or guns at. In addition to fighting the enemy, your submarines also have to deal with your own torpedo problems, including dud torpedoes and ones that turn on your submarine. RAF: Battle of Britain 1940 New Ed.